Performance Medicine & Sports Therapy offers a variety of services that can meet any individual’s needs. Our system incorporates knowledge and techniques from multiple disciplines in order to ensure that you achieve the best possible outcome. Check out the list of our services below, as we are sure to meet any or all of your needs. Whether you’re a professional athlete who’s suffered an injury or an orthopedic patient who needs assistance following surgery, we are here to help. From assessing nagging pain to advanced outpatient physical therapy, we provide therapy for all musculoskeletal issues related to the spine and extremities. Our services include outpatient orthopedic physical therapy, post-operative care, spine care and rehabilitation, sports rehabilitation, injury prevention, and work-related rehabilitation. Adjustments, or manipulations, as they are often referred to, involve the minor movement of vertebrae in the spine. The objective of this movement is to realign vertebrae that have shifted out of place for a number of reasons, ranging from normal daily activity to trauma, such as that from a car accident, for example. When these vertebrae are out of place, the overall effect is systemic, ranging from muscular to the central nervous system. Without proper alignment and flow of all nerves & systems in the body from the brain, we cannot function at our peak levels. ART is a patented, state of the art soft tissue system and movement based massage technique that treats problems with muscles, tendons, ligaments, fascia and nerves. Headaches, back pain, carpal tunnel syndrome, shin splints, shoulder pain, sciatica, plantar fasciitis, knee problems, and tennis elbow are just a few of the many conditions that can be resolved quickly and permanently with ART. Extracorporeal Shock Wave THerapy, AKA Acoustic Wave Therapy (AWT), is an FDA approved NEW technology, which incorporates the use of shockwaves to treat chronic, painful conditions of the musculoskeletal system. A shockwave is an instense, but very short energy wave traveling faster than the speed of sound. The word “extra-corporeal” means “outside the body”, and refers to the fact that the shockwaves are generated outside the body. This treatment is completely painless. Massage does more than create a pleasant sensation to the skin; it works the soft tissue (the muscles, tendons, and ligaments) to improve muscle tone. Massage also stimulates blood circulation and assists the lymphatic system, improving the elimination of waste throughout the body. The combination of regular chiropractic adjustments and massage therapy greatly increases the body’s ability to heal. The Graston Technique is a form of manual therapy known as soft-tissue, instrument-assisted, mobilization. It is one of a number of manual therapy approaches that uses instruments with a specialized form of massage/gently scraping the skin. This therapy is designed to help the practitioner both identify areas of restriction and attempt to break up existing scar tissue. Dry Needling is a term for a treatment procedure that involves advancing a thin filament needle into the muscle in the area of the body which produces pain and typically contains a ‘Trigger Point’. When the needle enters the trigger point, it causes a local twitch response, or spasm. This twitch response allows the trigger point to release, and the muscle to relax; thus reducing pain and restoring normal length and function of the involved muscle. Neurofunctional Acupuncture involves the use of thin needles to stimulate the nervous system (the brain and its network of nerves) in order to regulate the various organ systems of the body. Some of its many uses include inhibiting pain, increasing blood flow, normalizing muscle tone and function, and relieving stress to the body. Electro-Acupuncture involves adding an electrical stimulus to the needles in order to accelerate its overall effectiveness by increasing the power of the needle stimulus. Acupuncture helps with pain management, hormone issues, headaches, migraines, and many other pain related syndromes. The new standard of care and rehabilitation and training, the AlterG, gives you the opportunity to exercise without pain, even while you are still recovering from surgery or injury. The world’s best athletes and teams use the AlterG to reduce frequency of injuries, build fitness, and train and recover more quickly. They also use the AlterG as a core part of their athletic conditioning and training programs in order to strengthen and improve muscle coordination while minimizing stress on their bodies. Initial Visit 30 Minutes ($40): Includes introduction to the AlterG, safety instructions, and 30 minutes of AlterG use. Initial Visit 60 Minutes ($70): Includes introduction to the AlterG, safety instructions, and 60 minutes of AlterG use. Imagine being able to make a gait correction in real-time while being able to see how your legs and feet are moving while you are running. 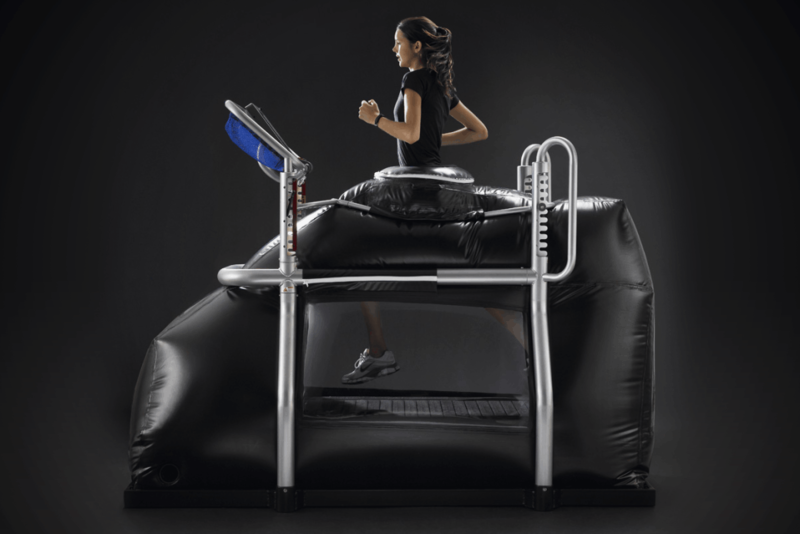 PMST is just the second facility in Texas to have AlterG’s new Stride Smart technology. Now we can integrate both gait and video analytics into therapy to identify asymmetry and gait deficiencies, enabling our providers to precisely dial-in the body weight support needed to enable pain-free, normalized gait. While this is great for post op and injuries, it is also key in getting real-time feedback for the athlete looking to improve performance. The new Stride Smart system provides objective data and visual monitoring for both patients and clinicians. Not only are we able to optimize recovery after injury or surgery, but we are also able to help athletes prevent injuries by using the invaluable data generated by the system. Patients can now see what they can’t feel. Patients can see their gait in real-time, and record video clips, play back in slow motion, and we can save those clips to later send to your coach or physician. By adding objective data measurements to AlterG’s Anti-Gravity technology, we can now quantify the impact of varying body weight percentages on gait symmetry and cadence in order to help patients increase efficiency in gait pattern while walking or running. – Includes 30 min AlterG session, run analysis by trained performance professional, videos sent via email after session, corrective exercises to support corrections that were made, 10% off AlterG run packages. We offer a wide range of medical services that are listed below. Each is customized to fit the needs of each individual patient. Whether you are in need of a new Primary Care Practitioner, or are an athlete needing a tailored recovery program, we will meet any of your medical needs. Our services range from wellness exams, blood screenings and sick visits to in-office joint injections. For specific medical questions or concerns please call our office. “Our focus is to build patients a detailed, individualized profile, tailored to their specific needs – whole body wellness – getting people feeling good and looking great”. Our VIP Concierge coordinates any in-house and outside referrals you might need. Our office works with the best doctors in Dallas-Fort Worth. Working with like-minded professionals helps keep our patients happy, and ensures our high level of care is continued even after you leave our office. Eliminate the frustration of calling around to find the right doctor and the baffling wait times. Let our VIP Concierge work with you to schedule your outside referrals. Free consultation, all injections done in office by medical provider. Ultrasound guided joint injections provided in office by our medical doctor.